Luton boss Nathan Jones celebrated his 150th game in charge of the club with a hugely entertaining 3-2 win over Scunthorpe this afternoon. 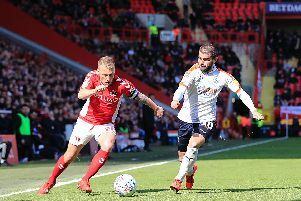 In the first competitive meeting since the Hatters had famously beaten their opponents in the Johnstone's Paint Trophy final, coincidentally by the same scoreline, the Town chief made one change, Jorge Grant in for Andrew Shinnie. Unlike recent games where Luton have conceded first, this time they led with their real attack on 10 minutes, as Matty Pearson's ball down the wing saw Harry Cornick spring the offside trap. With the visiting defence appealing in vain for a flag, Cornick burst away and despite taking a heavy touch, somehow slid at full stretch to divert his effort through Jak Alnwick and in for his second goal in as many home games. Scoring first has meant the Hatters win under Jones, simple as that, but this time they were hauled back within seven minutes, the out of position home defence now looking for a linesman's flag. It never came though, leaving Josh Morris completely clear as although James Shea saved well, the rebound fell perfectly for Lee Novak, who just had enough on his shot to beat the covering Sonny Bradley on the line. A seesaw first period then saw Town back ahead on 26 minutes though with a lovely team move starting with Bradley finding Pelly-Ruddock Mpanzu. He set Grant away, the midfielder running from half way and when he couldn't find a shooting chance, found Lee, who quickly shifted it on to his left foot and hammered an cracking effort beyond Alniwk and into the far corner. Hatters were sniffing a third and almost got it when James Collins did superbly to beat Rory McArdle on the byline, but with the angle against him, went for goal with Lee well placed, firing into the side-netting. However, Luton came close on 35 minutes when Stacey sent a lovely cross over from the right, Collins' header parried away by Alnwick. The hosts were dealt a blow just minutes before half time, as Lee's afternoon was ended, the striker going off holding his hamstring, James Justin coming on. After the break, Stephen Humphrys' deflected 20-yarder forced Shea into an uncomfortable stop by his line, while Funso Ojo shot over. With just over an hour gone, Glen Rea cleverly picked out the run of Collins from inside his own half, Town's in-form striker controlling well, seeing a low shot repelled by Alnwick. With the visitors beginning to dominate possession, they thought they had restored parity on 67 minutes, when Matthew Lund headed Ryan Colclough's ball across goal for Novak to score with a stooping header, only for the linesman to come to Town's rescue, ruling the strike out. Luton then produced a truly wonderful move from their own corner flag with Mpanzu winning the ball back, and Town going through almost the whole team as Grant fed in Cornick, who cut back on his left and the shot was blocked. Cornick should have virtually sealed victory, sent racing clear by Justin's perfectly executed pass, but despite Jones' instructions about shooting across the keeper surely ringing in his ears, opted to go back on his left once more, running into the back-tracking Ojo. Hatters did looked they had wrapped the points up though with five minutes to go, another incisive team move seeing Rea put Stacey through, his low cross gleefully slammed into the net by Justin. It should have been 4-1 immediately, Cornick releasing Stacey whose low effort was saved by Alnwick, Collins volleying the rebound into the stands. Luton were almost made to pay as in stoppage time, Humphrys got in front of Shea to net and lead to a nervy finale, centre back Pearson coming to the fore with a number of vital clearances. They were almost undone at the death as they had been against Charlton last week though, the defence parting, only for substitute Alan Sheehan to get a crucial block on Morris, with Cameron Burgess getting the rebound all wrong, as Iron boss Stuart McCall was beaten for the first time since taking charge back in August. Hatters: James Shea, Jack Stacey, Matty Pearson, Sonny Bradley, Dan Potts (Alan Sheehan 88), Glen Rea (C), Pelly-Ruddock Mpanzu, Jorge Grant, Elliot Lee (James Justin 43), Harry Cornick, James Collins. Subs not used: Harry Isted, Aaron Jarvis, Alan McCormack, Andrew Shinnie, Kazenga LuaLua. United: Jak Alnwick, Jordan Clarke, Cameron Borthwick-Jackson, Funso Ojo, Matthew Lund, Stephen Humphreys, Josh Morris, Lee Novak (George Thomas 80), Cameron Burgess, Rory McArdle (C), Ryan Colclough. Subs not used: Andy Dales, James Perch, Clayton Lewis, Charlie Goode, Jon Flatt, Lewis Butroid. Booked: Clarke 70, Borthwick-Jackson 78.